The optical pathway in a human eye is connected to the visual cortex (part of the brain which mediates the sense of light) via a nervous system. The nervous system comprises photo-receptors of two types – 1) Rods; 2) Cones (named on basis of the shapes of these nerve receptors). These photo-receptors, in turn, contribute to three types of visions with image forming functions, and are important for normal daily function and life quality. 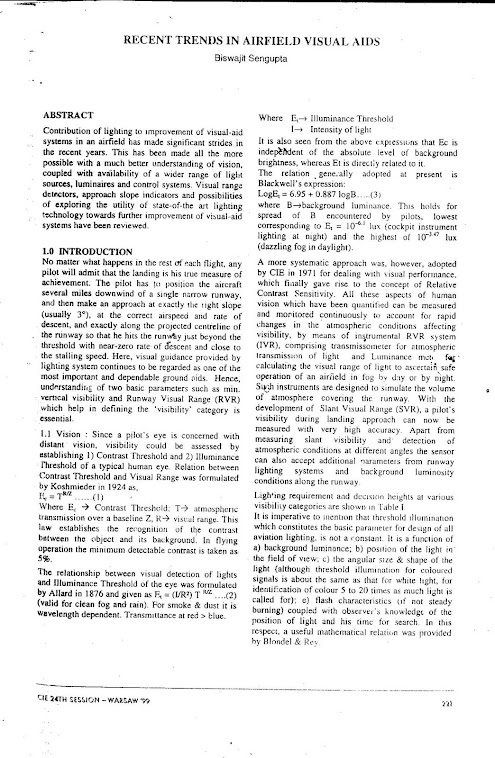 Scotopic (Rod) Vision-When the field luminances lie between 10⁻⁶cd/sqM to 10⁻²cd/sqM. This is a vision in the darkness. The world is grey and there is no sensation of colour. Mesopic Vision- Most important vision from a Lighting Designer’s point of view. This occurs when the field luminance is raised upwards from 10⁻²cd/sqM to 10cd/sqM. As the luminance moves upward the luminosity of red increases more strongly than that of the blues due to changing contributions of the Rods and Cone receptors. 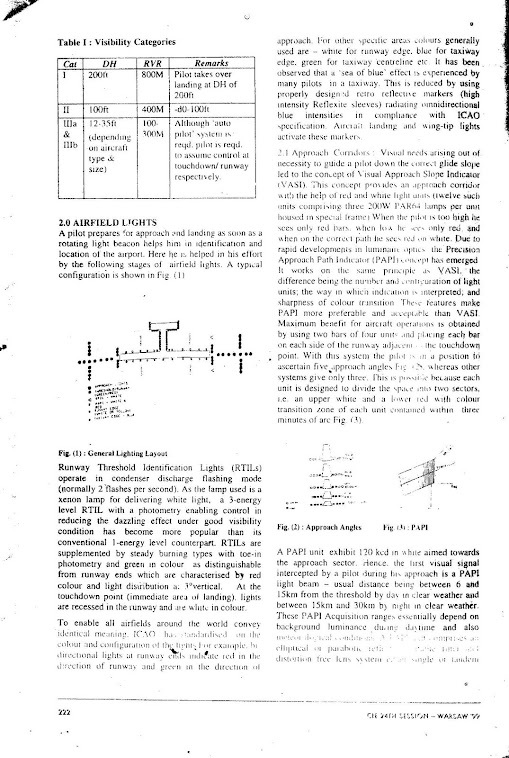 This is known as Purkinje phenomenon and is considered as an important aspect for designing effective road lighting, as it takes into account the luminance concept as well as the neurological aspects of road lighting. is above 10cd/sqM. Photopic vision is coloured. A third type of photoreceptor was discovered (first in mice in 2002) and then in humans and primates in 2005. These receptors were found in mammalian retina and are called Intrinsically Photosensitive Retinal Ganglion Cells -3) ipRGCs. Melanospin,a type of photo pigment and belonging to a family of opsins (light sensitive retinal protein)was found to form a mesh-work in ipRGCs These photo-receptors were found to be sensitive to the absorption of short wavelength blue in the visible region, peaking at around 480nM (deep blue).Unlike the classical photo-receptors Rods & Cones which contribute to formation of images, the ipRGCs are non-image forming. These cells contribute to sub-conscious non-image functions. 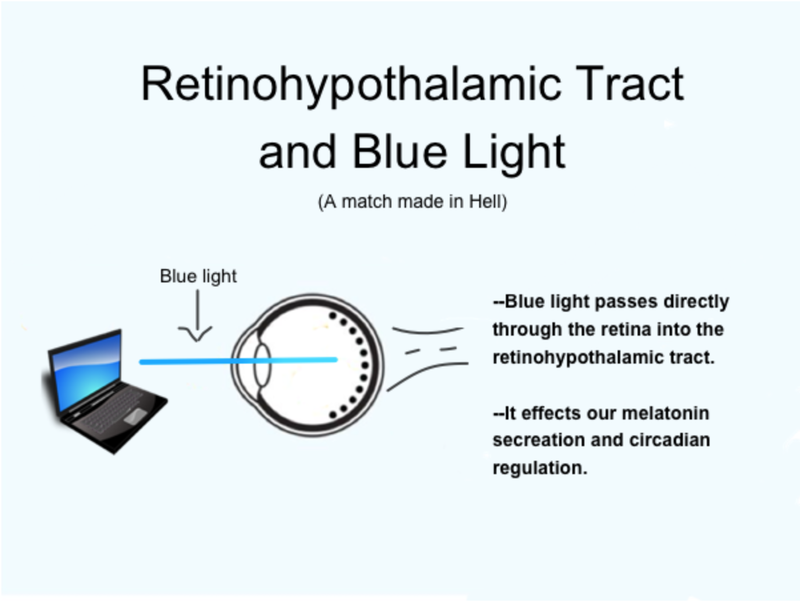 They serve as primary conduits through which photic information is relayed from the retina to non-image forming visual centres of the brain, ie direct communication to the circadian system which impacts mental and physical he­­­­­­­­­alth.­­­­ Extensive studies show that blue light after passing through our cornea and lens excites the melanospin in ipRGCs with absorption sensitivity peaking at 482nm (deep blue region). 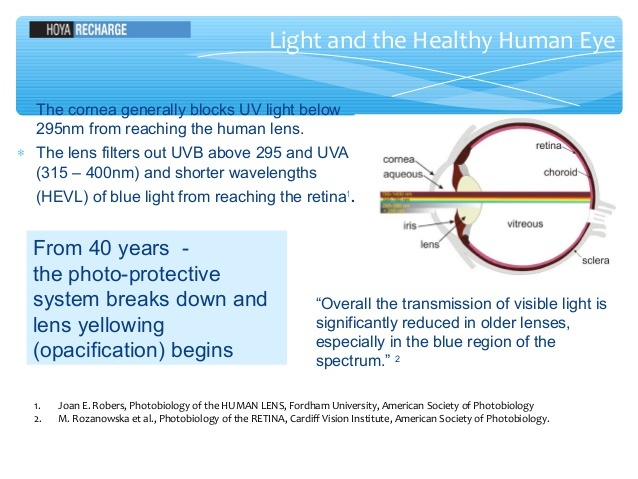 Photo reversal of bleaching (found to be most effective with blue light) takes place if the duration of exposure to this wavelength is either excessive or subject to shorter exposures over prolonged periods. It is a photo-chemical reaction which augments the capability of rhodospin molecules (photo pigments contained in the rods) to absorb photons in large numbers. This may lead to a cascading effect allowing the molecules to reach the critical number of photons required to induce damage in the retinal cells. 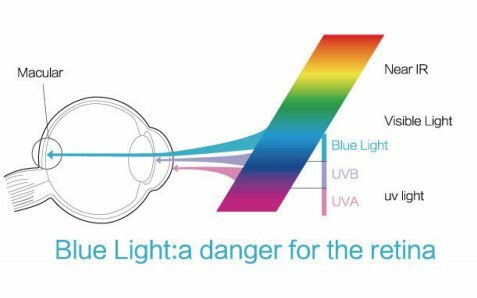 In view of crystalline nature of lens in infants and children, the penetration of blue light is high. 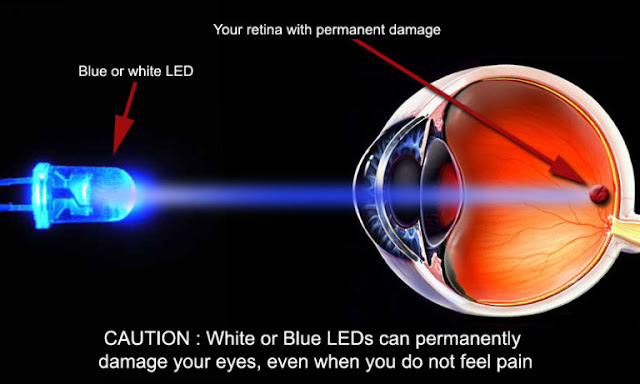 Thus this type of retinal damage is more pronounced in infants and children. Digital devices such as smart phones, iPads, e-readers (kindles), and LED lights did not exist a decade ago. Over the last five years or so there has been a galloping increase in use of these devices. LED which contains about 35% of harmful blue light has nowadays become a dominant technology for backlighting in all digital devices. But what is more disturbing is the gradual replacement of traditional light sources by more energy efficient LED source. 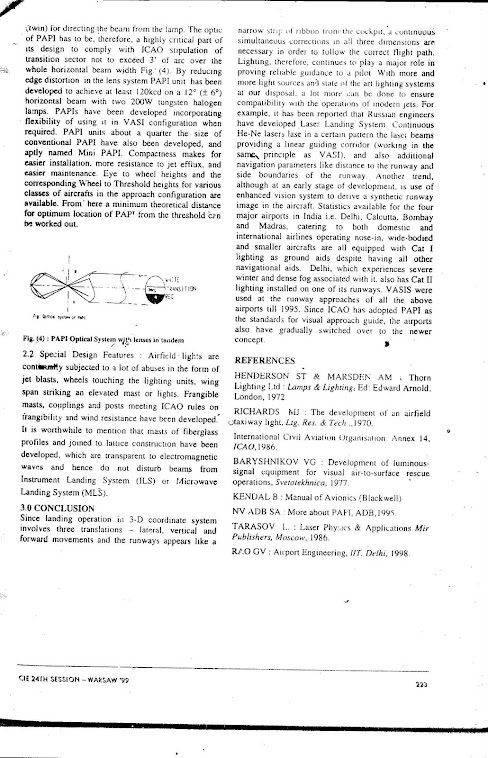 After discovery of blue LED at the end of twentieth century, extensive research started in order to commercialise the use of LEDs so that it can be used for general lighting. The first step was to get white light which was made possible by use of yellow phosphors. Despite great developments in phosphor technology, it has been observed that over a course of time bleaching of phosphors (particularly in high power LEDs) causes a shift in colour temperature. The blue light is not absorbed as effectively and, in turn, the blue light increases over time. Of late the city of Calcutta (Kolkata) has witnessed an invasion of LED lights in the public domain. Change to a new concept is good, but not at the cost of standard norms of good lighting practice. Here almost all streetlight poles and guard rails of flyovers are getting adorned with blue and white strips of LED. The blue is deep blue i.e. in the shorter wavelength. As a driver I have experienced a distracting and painful nature of drive through a maze of white and blue (mostly long stretches of blue) on Calcutta’s longest flyover from Race Course to Parama island at Eastern Metropolitan Bye Pass.It is not only distracting it gobbles the traditional streetlights on the flyover on which a motorist need to focus for safe driving.To add to the woes most of the strips are deep blue which adversely affect the ocular health of drivers frequenting such stretches. 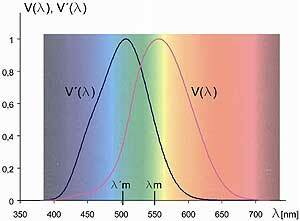 Relative Spectral Sensitivity of human eye. Left hand curve is for dark adapted eye and the right hand curve is for Light adapted eye. This photograph taken from the front seat of a moving vehicle shows how confusing it appears to a driver. How green is my country? Most of it is. In varying degree and shades. But when we travelled from Trivandrum to Kanyakumari on a train, the green opened up. Something different from I have hitherto seen. Enthralling. Soothingly caressed our visual system throughout the journey. We were struck by the abundant creation of nature as our train glided through the green corridor. Lined up on both sides by coconut trees, some short and some very tall. Interspersed with fleeting views of giant banana trees, with some dark green, some light green, some heavy and thick in foliage only to be broken by sporadic patches of bright green meadows This continued till our train reached the land’s end. 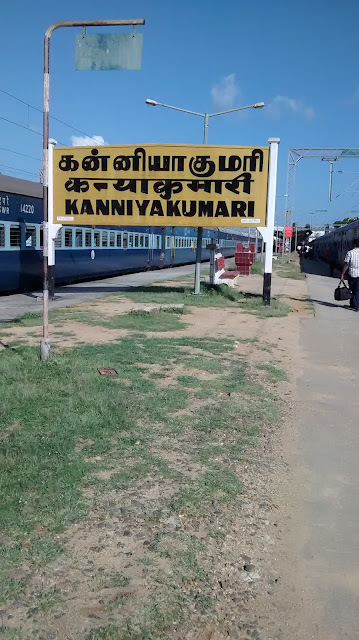 We put up at Vivekananda Kendra, not far from Kanyakumari station. A serene campus which induces an aura of meditativeness. So comfortable that we longed to prolong our stay. Getting up at three in the morning and sauntering down the pathway in darkness to the sea about one kilometer from our lodge was a thrilling experience. At the seashore, we waited to watch the sun rise over the confluence of the Indian Ocean, Bay of Bengal and Arabian sea. The moment the sun rose, a twinkle of fire lit the snowy clouds at the horizon. Then the entire sea and Vivekananda Rock would get suffused with gold and blue. We walked back to our base after getting cheered by the beauty of such sunrise. Apart from serenity and sunrise what we liked most about Vivekananda Kendra was their free bus service at fifteen minutes interval up to the city center near the beach. From there one could walk down to the ferry point for Vivekananda Rock, or take auto or toto to sunset point and other sightseeing places. Sunset is again invincibly beautiful with rocky faces turning to ruddy gold as the sun sank into the sea. From the shore of Kanyakumari up to Vivekananda Rock the water is rough, splashing wherever it encounters the jagged rock formations underneath the sea. It is hard to believe how Swami Vivekananda swam this rough stretch to reach the huge rock protruding out of the sea in order to meditate atop the rock before leaving for the USA to deliver his famous discourse on religion at Chicago. From Vivekananda Rock, the view of the meeting point of Indian Ocean with Arabian Sea and Bay of Bengal is a mind-blowing sight. So clear is the demarcation and different shades of the ocean and the seas. 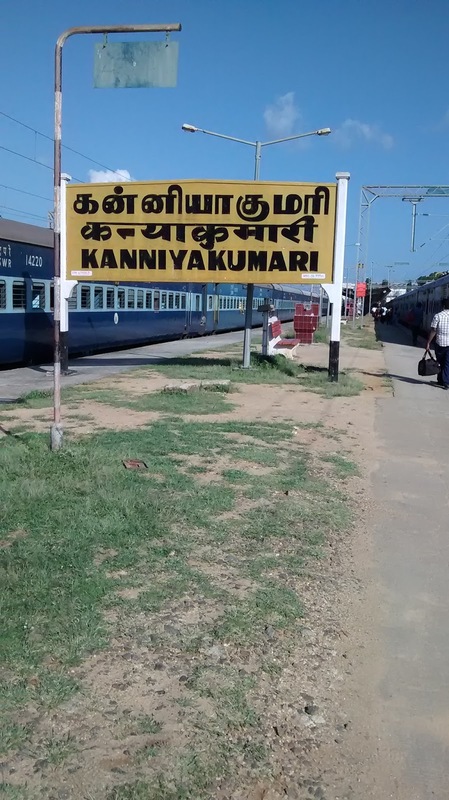 After three days of stay at Kanyakumari, we travelled northward deeper into Kerala. We retraced the railroad up to Trivandrum. Beyond, it continued through similar green corridor only to be broken at places by swathes of rippling waterways of Kerala’s iconic backwater. Yes, our destination was Kottayam, and from there to Alleppey to discover the entrancing Backwaters. 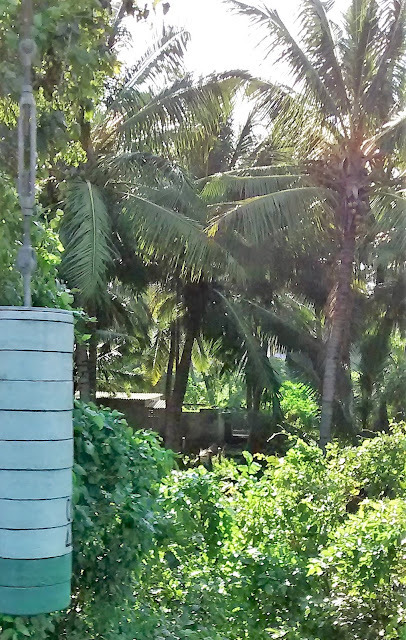 Allepey or ‘Allepuzha’, a town endowed with whatever nature showers in one’s dreams – sea, serene and wonderful beaches, backwaters infringed with lengthy land strips of swaying coconut trees. We moved into Allepey before sundown. We dumped our luggage at Pine Beach Residency, a homestay arrangement. 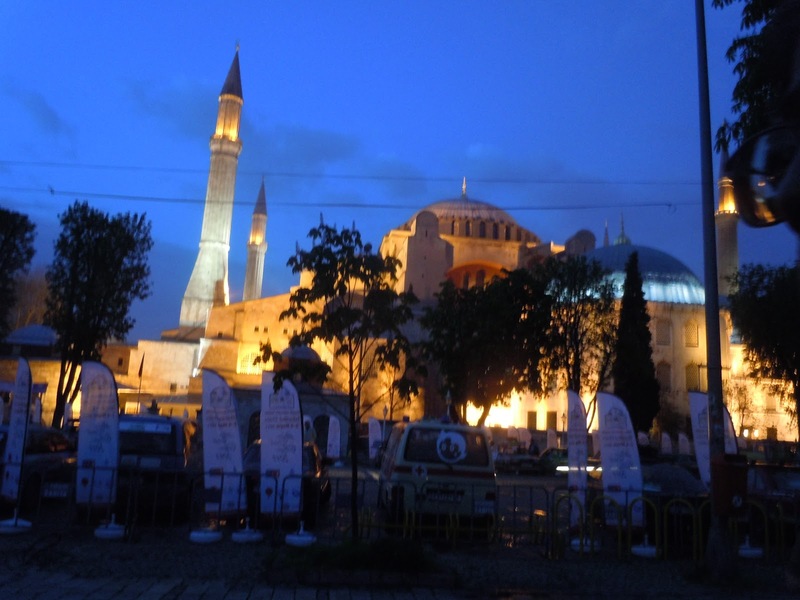 Homestay is quite popular in this touristic city. Hungry after the journey, we walked down the beach to Indian Coffee House. I ordered beef fry and toast to satiate my appetite, as I am extremely fond of Kerala’s beef fry. In the night we indulged in romantic candlelight dining on the white beach at Palm Beach Residency. Half a day trip on backwaters in exclusive houseboat was another first. Nature engulfed us with its extraordinary beauty. The boat stopped at one of the several islands on the waterway. We had Karimeen fry. A delectable sweet water fish of Kerala, very similar taste of much sought after ‘Koi’ of Bengal. Local people told us that this fish is available in plenty in the backwaters. After returning back to Allepuzha Boat House Station, we decided to have a hearty lunch at one of Kerala’s most popular eatery. Thapp is walking distance from the finishing point of Allepuzha Boat House Station. One has to just cross the footbridge over the backwater canal. Since the recipes of Kerala are among the best in South India, we ordered ‘thalis’ (meal platters) – plus mutton curry for self and pomfret fish masala for my wife. Believe me, this is one state in India where servings on a platter show no stinginess. Sumptuous Kerala thali comprising rice, three or four varieties of vegetarian preparations, rasam, sambar, fish curry, pappad, pickle, payasam galore.Added to this one's choice of a non-veg delicacy. All equally delicious and filling. Another discovery at Allepuzha was rejuvenated ayurvedic full body oil massage of Kerala. It works wonder. After two refreshing days in Allepuzha, we took an early morning train to Thiruvananthapuram, the state capital. The train journey captivated us again through the resilient green corridor. Thiruvananthapuram (colonial name Trivandrum) is a beautiful city on the shoreline of Arabian Sea. Beautiful because of its internationally famed Kovalam Beach and Shanghumukham Beach adjacent to the airport for sunset viewers; beautiful because of old temples of Dravidian architecture including the Attukul Temple and the famous Padmanabha Swamy Temple dedicated to Lord Vishnu; beautiful because of Kuthira Malika Palace adorned with carved horses built by Maharaja Balaram Verma, King of Travancore during the eighteenth century ( now a museum displaying paintings and various priceless collections related to the Travancore family); beautiful because of the city’s colonial architecture; beautiful because of its proximity to Western Ghat mountain range that runs parallel to the Arabian Sea. The newly constructed Central Bus Terminus, opposite Trivandrum Rail Station is also laudable. We had taken a bus from here to visit Ponmudi about sixty kilometers from Trivandrum. The route to Ponmudi passes through clusters of thickets including banana trees, coconut trees, pine trees and rubber plantations leaving us gaspingly admiring the infinite green spaces. Sunshine drifted in and out of the thickets creating patches of light and shade as our bus moved on gentle slopes of the winding roads. Because of the thickets all around the realization of 3000 feet climb came only after flurries of cool mountain breeze started wafting through the window. A pretty hill station so close to a bustling city. And nothing more refreshing and relaxing than sights of mountain flowers, butterflies, rubber plantations and the sound of gurgling springs. We had lunch at Ponmudi, watched monkeys playing their tricks before returning back to Trivandrum. As our flight started its descent over Las Vegas I was dazzled by the lights below. Lights glittered all over like a huge, sprawling net. Appeared to be laid for the aircraft to land on it like a trapeze artist. I frankly admit that I have never seen such myriads of lights before. Not even when our plane hovered over glittering Manhattan while on its descent at New York JFK. Our son Arjun had already fixed up a car with rent a car center. We were transported there in shuttle service available from terminal 1 of McCarran International Airport. Arjun completed the formalities with the car company and then we drove towards the city center with Arjun at the wheel. After a short drive, we were at the famous Las Vegas Strip. I must admit that the Strip looks vibrant and fascinating in the night, more than any other place I have seen on our planet. Like a fairy tale world. Mandalay Bay, Luxor, MGM, Excalibur, New York New York, David Copperfield. The illuminated Statue of Liberty in front of New York New York and the medieval English castle type architecture of Excalibur exteriors stand out in a maze of glittering hotels and casinos on Las Vegas Strip. We stayed two nights at Excalibur, named after the legendary sword of King Arthur, and tried our hands at the casino. Started our journey for Grand Canyon in the morning. Via Boulder City in Nevada, our first halt was at the famous Hoover Dam. Built in the early twentieth century during the Great Depression to tame the river Colorado in the Black Canyon bordering Nevada and Arizona, it is a showpiece of an engineering marvel. The reservoir which came up during construction of the dam and hydroelectric project is known as Lake Mead, considered to be the largest reservoir of America. After going around Hoover Dam and almost gobbling down a hearty American breakfast, we embarked on the final lap of our journey. Soon we found ourselves whizzing through the great Arizona Desert. Dotted with cactus trees, some as large as fully grown banyan trees, replicated images I tried hard remembering in cowboy movies of yesteryear I had seen as a youngster. These cactus trees took up various sizes and complex shapes when we turned left from the highway and took a shorter route through the desert to reach Kingman for fuelling and refreshment. The route happens to be the historic route 66, the mother road of America which came up in the early twentieth century and has remained unspoiled over the years. A very fascinating route as it retains the character of America during early 1900. It leads straight to the Black Mountain. On our way, we saw a very interesting small town, with horses, cars, bikes and a pub looking like a ranch. To me, it was a captivating sight as it appeared to emerge out of a classic cowboy story. For Kingman, we had to turn right after about an hour’s drive. If we had driven straight we would have reached the nearest point of Grand Canyon i.e. the West Rim. A brief stopover at Kingman for fuelling and delectable bites on American Ice Cream at the gas station was delightfully refreshing. 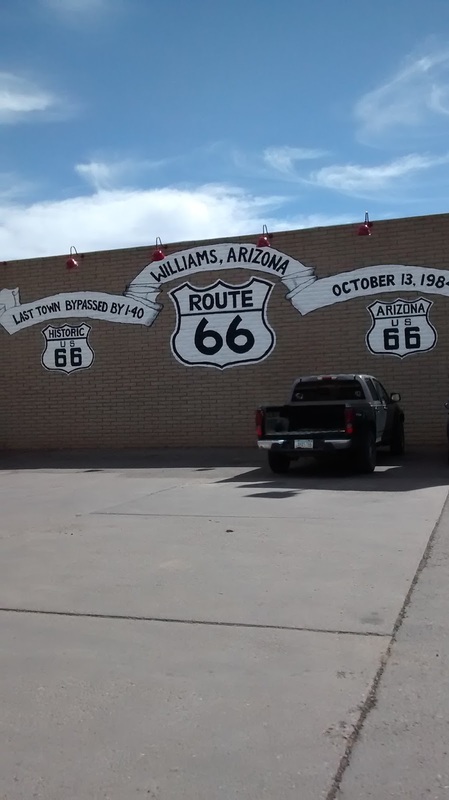 We then drove down to Williams where we had booked our hotel. 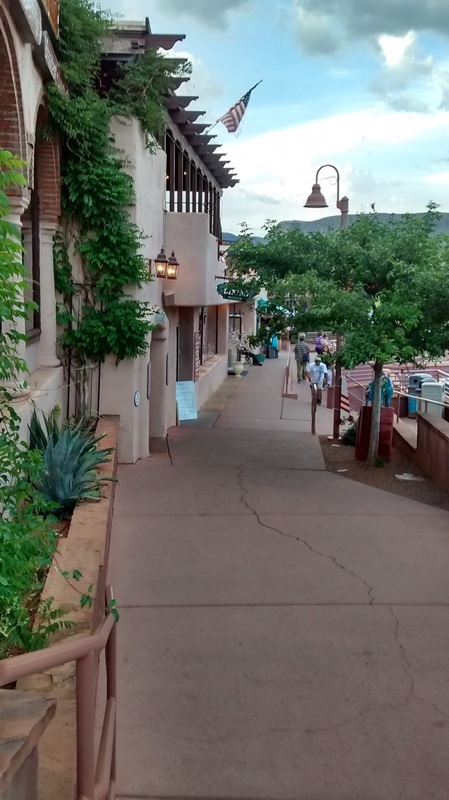 A quaint little town, cuteness radiated from every nook and cranny. Right from Highlander Motel where we stayed, attractive cafes, warm restaurants with live music, gas stations, departmental stores, the pleasant chill of a hill station all seem to gel so wondrously. 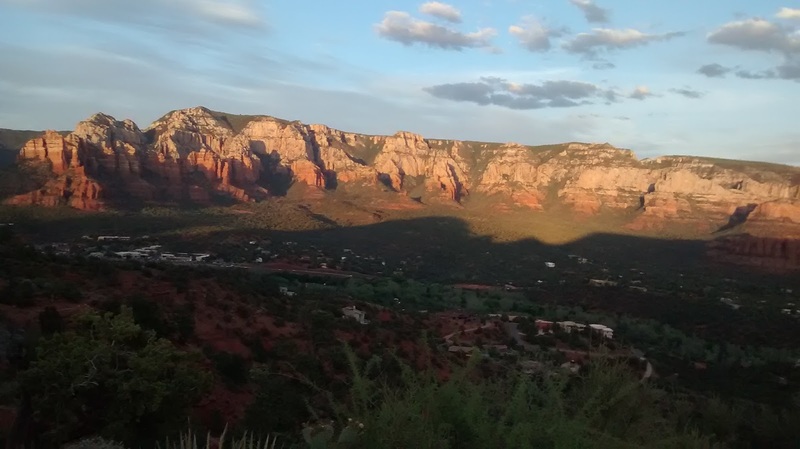 After settling down at Williams we decided to catch the much-hyped sunset at Sedona. As our car climbed up and down the hilly terrain to get to Sedona, it brought us unique vistas of Oak Creek Canyon at the beginning and Red Rock Canyon / Secret Mountain while nearing Sedona. The ride and the views were spectacular and at parts formidable! Particularly while negotiating close to the steep canyon walls. 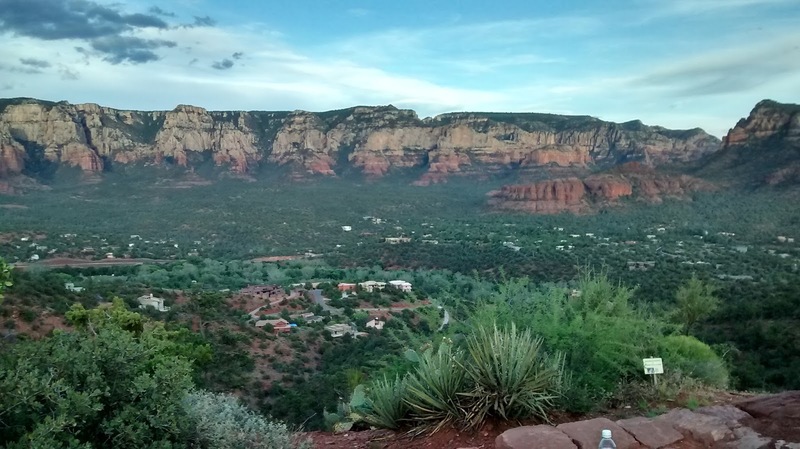 Sedona is again a lovely little town beautifully decorated with artistic statues, and watching the sun go down the mountainous silhouette from sunset point was an exhilarating experience. 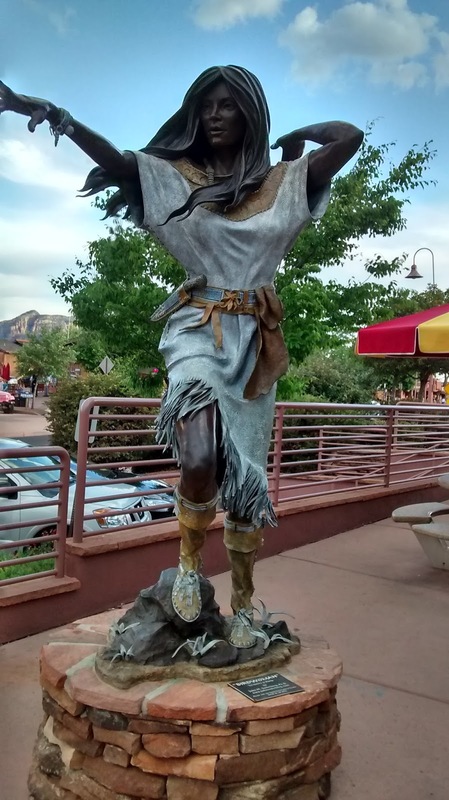 Next morning we were overtly excited while gearing up for visit to the Grand Canyon about 55 miles from Williams. Las Vegas is about 2000 ft above sea level; Williams is about 6000 ft above sea level and Grand Canyon is about 7000 ft above sea level. The road distance from Las Vegas to Grand Canyon is about 290 miles. So when we reached the Grand Canyon National Park we never had an inkling that we have climbed over 5000 ft on our journey from Las Vegas. It was as if driving on plains throughout. 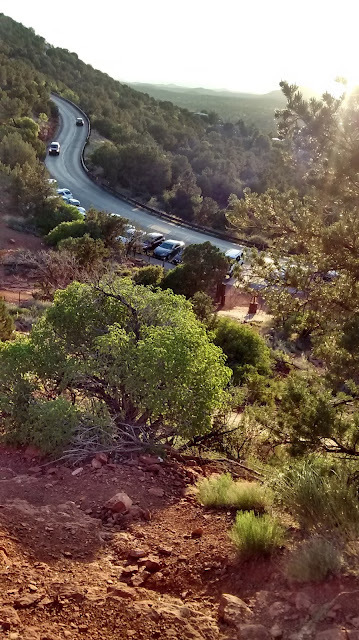 The mystery deepened when we took the park and ride a shuttle bus from the Grand Canyon Visitors Center. I was still desperately trying to figure out how our bus would be negotiating such giant gorges I have seen only in movies and photographs till then when our driver announced that the first viewpoint has arrived. And there it was. As if from nowhere a spectacular sight opened up and greeted our eyes. It was only then that I realized that we were at an elevation of about 7000 ft above sea level. The immense buttes, some steep jagged rocky walls running down straight and deep down at the bottom the Colorado River winding its way – a real treat for the senses. The formidable vastness of the ravine is breathtaking. Created by Colorado River this earth’s wonder evolved a billion years ago and the current Grand Canyon is said to be six million years old. The South Rim is regarded as the heart of the Grand Canyon. The viewpoints covered by the shuttle are Trail View Overlook Point, Maricopa Point, Powell Point, Hopi Point, Mohave Point, the Abyss, Monument Creek Point, and Pima Point and terminates at Hermit Rest. On the return path, it stops at Mohave Point and Powell Point. Adventure lovers can take the trail paths to Hermit Rest. A new vista opens up as one moves from one point to another. Views those are vertiginously stunning and beautiful. Shades of red, copper and yellow, deep chasms at places, rocks jutting out in the form of table tops, nature’s architectural wonders like formation of temples aptly named Vishnu Temple, Isis Temple and edifices looking like the walls of fortress all cut out and carved from the rocks by the hand of nature millions of years ago. Major John Wesley Powell, a soldier, and a naturalist was the first man who set out with a team of nine men and four boats to explore the hitherto unknown Colorado River and Grand Canyon in 1869. Six of them dropped off within three months of the expedition after travelling 1500 miles and losing boats and essentials in dangerous rapids they encountered on the river. At the fag end of the journey, the three remaining men deserted Powell to get back to the mainland. They are believed to have lost their way in the fearsome labyrinthine ravine and never to be found again. Previously Grand Canyon was known as Big Canyon. 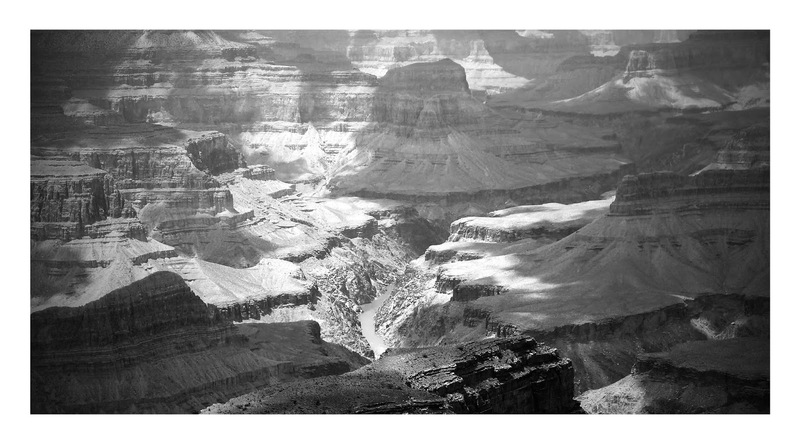 After the expedition, Powell was so impressed by its grandeur that in 1871 he termed it as Grand Canyon.